Whether you need to turn in scores to an umbrella school, or if you'd like to show a relative how well your child is retaining information, you'll find it easy to use the review questions. As with any homeschool material, this is a tool. You choose which questions to ask; you choose the way this material will benefit you the most in your homeschool. Questions are divided by subject (Bible, social studies, science, and language arts) as well as by grade (1 & 2, 3 & 4, and 5 & 6) allowing you to tailor-make each test for your child. Student pages are included, as are instructions for using the material and teacher pages with answers in bold italics. You'll even find instructions for figuring the percentage for assigning grades. 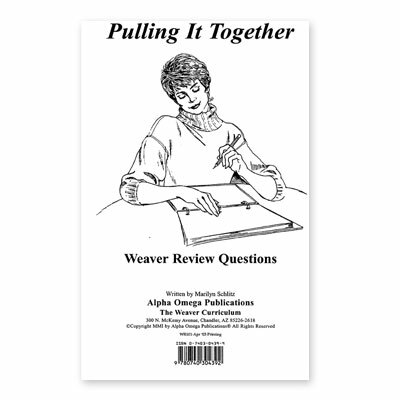 Order Weaver Review Questions Volume 4 from Alpha Omega Publications today and be encouraged—your child is learning!